On the way out of dinner with the running group last night, we stopped at the game where you use a crane to win a stuffed animal. 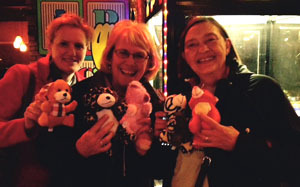 When we pass those machines, our first thoughts are “you never win” or “that’s for kids.” Well, we won five out of six times and we were giggling like kids. Next time you pass one of those machines, drop in a dollar. Or drop a few quarters in the bubble gum machine. It’s pretty easy and more than alright to feel like a kid again. Unravel your complicated life if only for a moment. Dare to have fun, play and laugh every day. Pretty simple. I see the Barry talent now coming out in the two of you! How fun to act like a kid in this grown up world we have been forced into! Thanks Laura – no one like Jeanne’s smile and laugh to keep us young.